College of Engineering, Pune (COEP) is the third oldest engineering college in Asia. It is an autonomous institute, ranked among the top engineering colleges in the country. 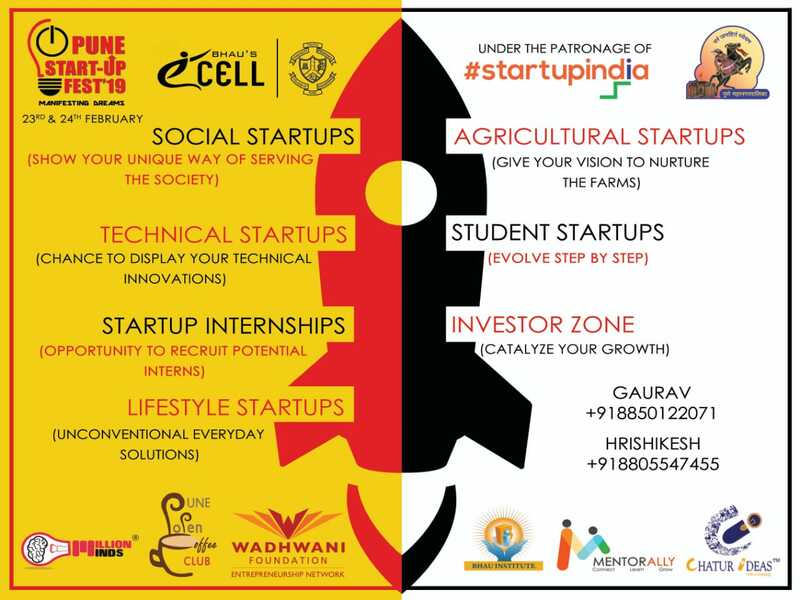 Pune Startup Fest'19 under the patronage of Startup India and in association with Pune Muncipal Corporation is COEP's annual Entrepreneurship initiative. The festival aims at using progressing Entrepreneurship skills to foster the growth of societies through its theme "Manifesting Dreams".This year we will host the START-UP EXPO. Various Startups from all over the country will portray their innovative ideas.With Support of Bhau Institute of Innovation, Entrepreneurship & Leadership we aim at making changes in today's world. Google’s founders Larry Page & Sergey Brin transformed the way we look at the internet today. Companies develop new technologies that satisfy the demands of consumers and businesses, or integrate existing technologies creatively and innovatively. This zone is dedicated to such startups. The Agriculture Industry employs about 40 percent of the world population. This sector is influencing many entrepreneurs and is creating a wave of Agri-Tech based startups. Unconventional solutions to everyday problems. Innovation to sustain livehood. A quick fix or tweak that can ease lives of various individual. Everyone wants a healthy hassle free life, these startups will make it the perfect enabler. Bill Gates. Mark Zuckerberg. They’re self made billionaires who made their fortunes in tech and they started their businesses while they were still students. There are no boundaries to being an entrepreneur, but they never stopped believing in themselves. Working for a Startup can be more valuable than a Fortune100 company. A student with little proficiency might end up bagging the Internship which will add value to their career at a very early stage. Interns bring in a lot of energy and are more competitive than a regular hire at times. Startups need a catalyst to accelerate their development. Seed investment, Angel Funding, Connections, Mentorship are much needed attributes from an Investor. They support as a backbone to the entrepreneur. We also have dedicated mentors who will guide students who just have an idea and don't know how to proceed further. Want a chance to get recognition and feature in a leading newspaper? Come to Pune StartUp Fest and make a report describing the event. Exclusively for School Students. Have you ever dreamt of having your own IPL team? Have you ever thought your favourite player should be in your favourite team? Get a chance to build your own team in this virtual IPL auction! A single news can send ripples through the stock market. Feel the rush of the stock market in this stock market simulating game! Do you think you know everything about the business community? Well think again in this quiz exclusively based on the business community!